Those who feel that over time their skin has become damaged know that they need to start taking care of their skin. It can be hard to look in the mirror and see all of the flaws, but there are things that people can do to start repairing their skin. There are steps that people can take in order to get their complexion back on track, and looking beautiful again. While there are many options for different types of creams out there, Skinceuticals CE Ferulic samples are a great way to get started. They are easy to order, a great value compared to the regular size and there is even the option of getting free shipping within the United States. This treatment involves the use of antioxidants, which are great for the skin and fighting off some the regular damage that happens throughout the years. There are also some other ingredients such as L-ascorbic acid, alpha tocopherol and ferulic. These are all great ingredients for getting the results that people are looking for, and preventing future issues from coming up. These ingredients together all work to help make the skin look much better and prevent some of the common problems that plague people today. This sample pack contains six of these treatments, in vials which each contain 3.75 ml of the product. 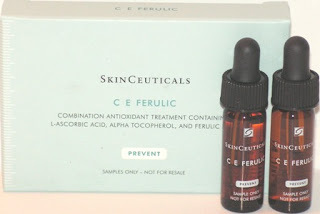 Also, those with sensitive skin never have to worry about Skinceuticals CE Ferulic samples being too harsh for their skin. This is a treatment that is specially formulated to be gentle on the skin, so everybody has the chance to try these and start seeing the results they've been dreaming about. It will also help those who have dry skin, and it won't be irritating or cause any of the other issues that many other types of skin creams often cause. This product is great for those who are dealing with hyperpigmented skin that has been damaged from the sun. It can start to take care of some of those issues, and can really boost the self-esteem of those who are struggling with having those spots on their face. 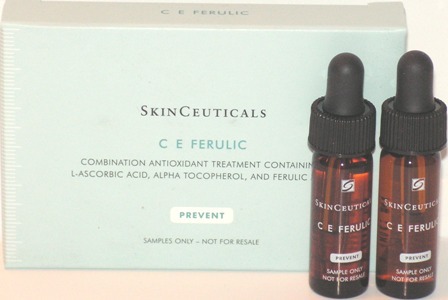 The Skinceuticals CE Ferulic samples will also make the skin look generally more radiant, and provide users with more comfortable skin. In addition, it will help to soften and smooth the skin, which can make a huge difference in the overall look and feel of the skin. Anybody who wants to get started improving their complexion can try this product without worrying about irritation to their skin. These samples are a great value compared to the regular size bottles, and have the advantage of keeping the rest of your supply fresh and sealed until you need to open them. They are also great as a space-saving travel size. And btw, why not share one with your bff?